It’s the middle Monday of September, and you know what that means. We’ve just finished off our first weekend of Halloween season, with Universal Studios Hollywood’s Halloween Horror Nights and Six Flags Magic Mountain’s Fright Fest opening their 2018 runs. We’ll tackle Fright Fest later this week. The thoroughly enjoyable Universal Monsters maze, giving its classic monsters a bit of a new twist. Last year’s review of Horror Nights primarily focused on the relative crowd relief compared to 2016, which saw our most packed Horror Nights visit ever—enough that it seriously detracted from the quality of our experience. The crowds and waits last year ended up being among the lowest overall that we’ve experienced, and though half of last year’s events featured repeat themes, we enjoyed our time. At peak wait times, the lines could be pretty long. This year, the waits were a little higher, but the overall crowds remained lesser than two years ago. It seems Horror Nights may have learned from older media night problems and instituted a cap on opening night sales, restricting them to online only. Although signs on site indicated that the event was sold out, tickets could be purchased an hour before the 5:00pm early entry, indicating the sell-out was a bit artificial. I have no complaints about that, though, since the celebrity and media-laden nature of opening night meant that mazes were always subject to delays if VIP’s were brought through, or if filming was occurring. Fortunately, in our experience, the delays were relatively minimal, with nothing approaching the bitter experience we had in The Exorcist line a couple of years ago. And as with last year, there were plenty of signs warning guests of the possibility that maze lines could be temporarily held at any time due to production crews or filming taking place. Energetic talent in the Monster Masquerade scare zone. As for the event itself, at this point, long time fans can predict what each Horror Nights will contain: recreations of box office or television franchises recreated with thorough Hollywood detail, transporting guests into environments that mirror what viewers see. Though different films or intellectual properties are used, the mazes always feature the use of “Boo Boxes” (not my term, but I think it captures the scare perfectly)—startle scares that utilize some sort of visual distraction to divert guests away from the actual scare, which inevitably consists of a sudden loud, crashing sound effective, rapid strobe lights, and a scareactor popping out of a door, window, or other disguised opening. There would also be water effects and a few foul scents sprinkled throughout assorted mazes or in the Terror Tram. And scare zones could be counted on to have chainsaw fiends, talented stilt walkers, and aggressive (but non-dialoging) talent. Surprisingly, there were zero scents used and only one maze with a water effect. I must give credit to the Horror Nights designers for not relying on these elements like a crutch—something that has appeared to be the case in the past. Michael Myers in the Halloween 4 maze, one of countless “Boo Box” scares. However, Boo Boxes were once again utilized in full effect this year, with maze relying almost exclusively on this type of scare. I’d venture to say that 98% of the scares in the mazes were of this variety, with the remaining 2% being so noticeable that they made their mazes seem refreshing in contrast. And in a truly amazing (and almost comically absurd, by the time we went through our final maze) intentional maze design strategy, all seven new mazes ended with a “Boo Box Tunnel,” or zig-zagging, blacked out pathway with no theming but two or three (usually three) “boo box” scares to presumably send guests fleeing out of the maze in terror. This design element has been used to conclude mazes like The Exorcist and in the middle of mazes like Freddy vs Jason in the past, and while it can be effective with a relentless adrenaline rush, the fact that they were implemented in literally every new maze ended up cheapening their impact and effect. Another frequent complaint of recent years—the prevalence of featureless black hallways between scenes—was also on display ever. In fact, Poltergeist featured the longest such black hallway we’ve ever experienced at a Horror Nights maze—an astounding three segment, four turn series that was extended enough to feel noticeably awkward. This was the most egregious example (and despite this, Poltergeist ended up being our favorite maze of the night because of its strengths in all other departments), but every maze could count on several blacked out corridor moments. Poltergeist, a spectacle of a Horror Nights maze. 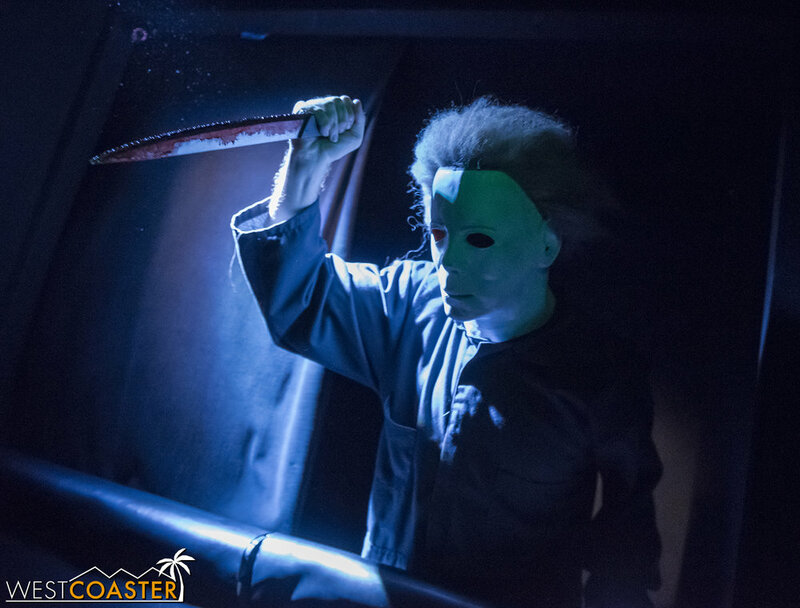 Those criticisms said, the mazes overall seemed to be received better than the aggregate of those from last year, according to many guests from which I solicited opinions. I would once again say that no single maze approached all-time legendary status (Poltergeist was close for me, personally), but together, the new mazes were more solid than last year. The big anticipated hit, Stranger Things, commanded lengthy lines all night, of course, but for us, it was actually a middle-of-the-pack maze. On the other hand, less heralded maze, Universal Monsters, ended up being the surprise draw of the evening, providing some classic scares, beautiful and thorough theming, and an enjoyable, rock/dubstep soundtrack supplied by Guns ‘n’ Roses guitarist, Slash. 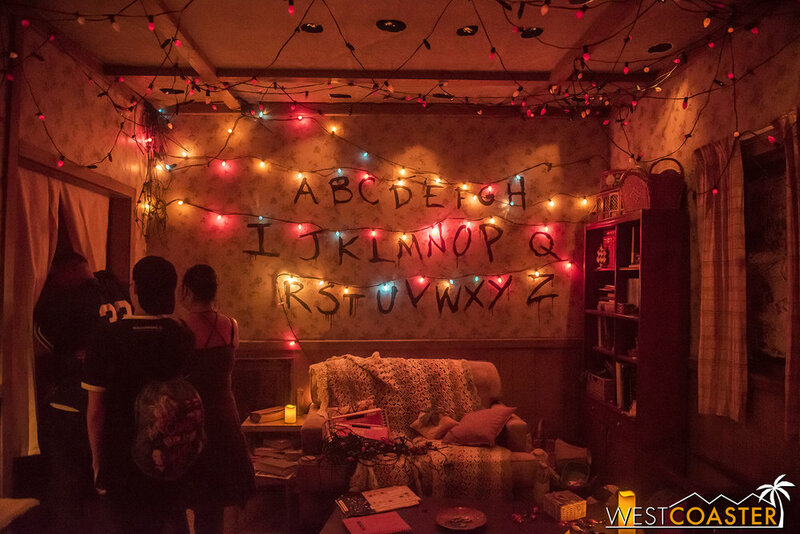 The Byers House in the Stranger Things maze. 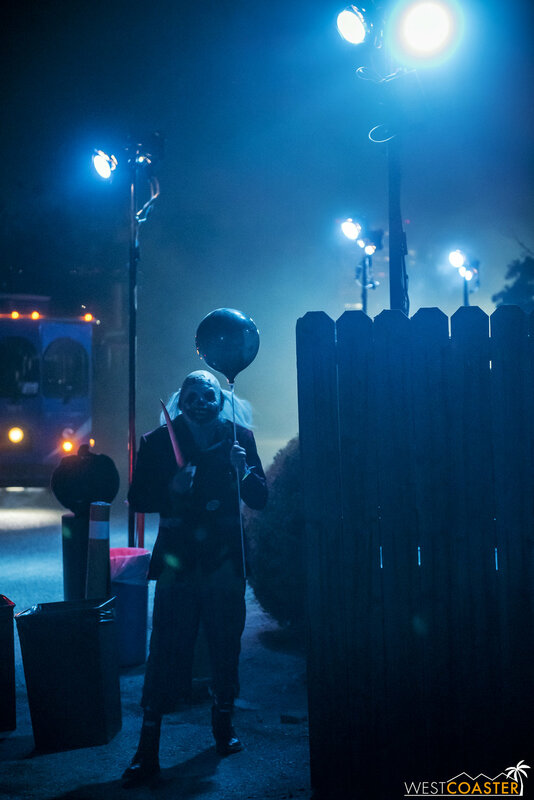 Trick ‘r Treat and The First Purge were both solid contenders as well. The first featured some very photogenic sets as well as the only moment in the entire night where a scareactor actually (half) got me—kudos to the werewolf coming out of a corner I did not expect after passing another werewolf in the same room a moment earlier. The second actually featured a non-boo box scare—something that I appreciated—not to mention solid timing and energy from the cast. Trick ‘r Treat (the maze). The Horrors of Blumhouse: Chapter Two proved to be fine enough. From a technical standpoint, it was a standard maze, with numerous well-executed moments and good scare gags. As for Halloween 4… unfortunately, this proved to be a lackluster maze for us—a typical Horror Nights formula that was not as up to par in execution as some of the other formulaic but strong performing mazes. The Horrors of Blumhouse advertises two movies but adds a third in The Girl. The scare zones also saw an overall improvement over last year. 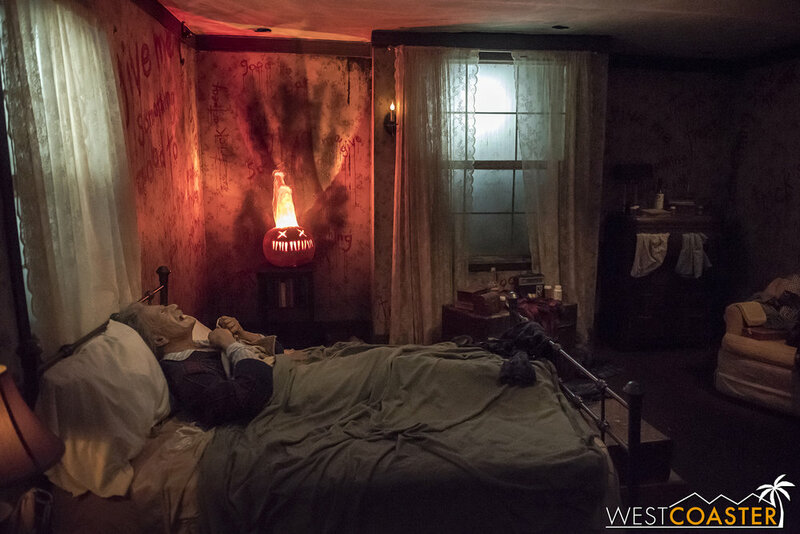 Because of construction on the closed off Baker Street, the entry area that is traditionally grouped as one scare zone was split into Hell’s Harvest and Trick ‘r Treat to make up. In addition, Monster Masquerade served as the scare zone gauntlet into which guests exiting Universal Monsters were dumped. All three were solid, with energetic and engaging talent. Hell’s Harvest, the scare zone greeting guests entering the park. Trick ‘r Treat (the scare zone). Toxxic Tunnel—the connector between the lower lot and the Metro Lot backlot—was exactly the same as last year, except with a second ‘X’ in the name. I look forward to next year’s presumably NC-17 version, though, at least based on the naming progression. Toxxic Tunnel, now with more X’s! Holidayz in Hell was the scare zone shining beacon, though. Located at the entrance to the Metro Lot mazes, it took what was used in Dark Christmas—our personal all-time favorite and best Horror Nights scare zone—and applied it to holidays throughout the year. The result was some gory, twisted, humorous theming that might have reused a plethora of props from previous Horror Nights but did it so well that we easily overlooked the set recycling. 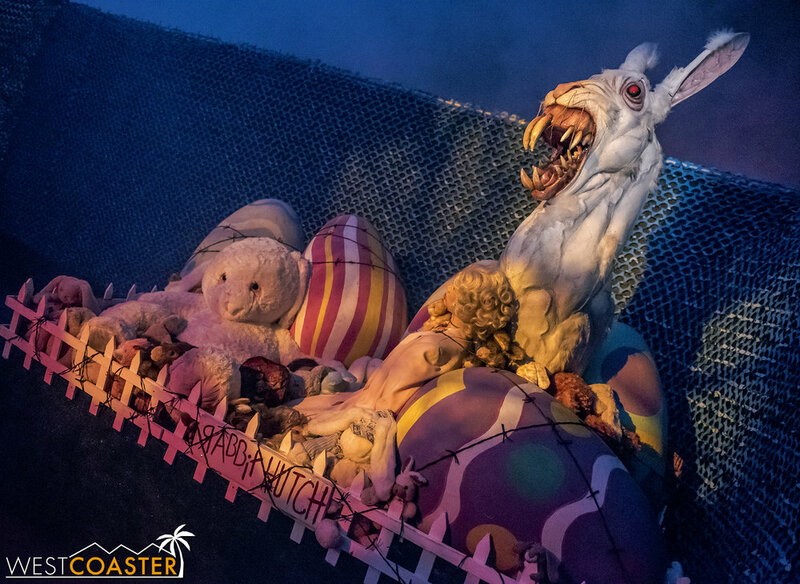 This demented Easter bunny is one example of the warped sense of humor throughout the Holidayz in Hell scare zone. As far as the Terror Tram went—it was once again more of the same re-skin of the tried-and-true formula of past years. But the return of Hollywood Harry provided an entertaining touch, and the approach of having the Terror Tram be a series of mini hybrid maze/scare zones with individualized themes did make things feel a little fresher than usual. Hollywood Harry has returned to terrorize the Universal Studios backlot at night. He’s quite murderously entertaining. At the end of the night, we found Horror Nights to offer the same as it always has—an excellent visual production coupled with less imaginative and foreseeable scare techniques. And though we’ve criticized its formulaic approach to haunted attractions in the past, at this point, we’ve come to accept that this is the intentional manner in which Universal Studios will be running its Halloween event as long as the current creatives remain in charge. It makes sense in within the cinematic setting, anyway. Movies require take after take to achieve the perfect shot, and repetition in acting is key to making moments believable. At Horror Nights, scareactors perform the same action over and over as they recreate horror movie loops. And it’s not as though the execution isn’t effective. The above nitpicks aside, Horror Nights still generates plenty of scares and screams. It remains popular as a very high-profile Southern California haunt. 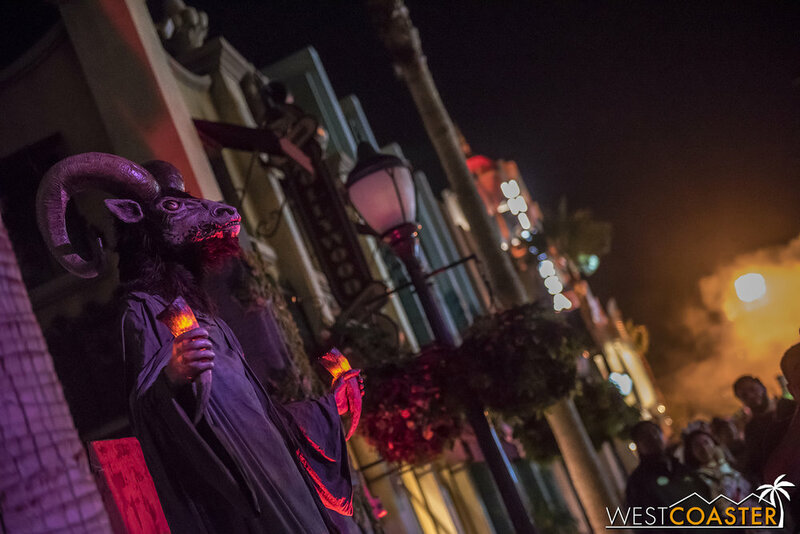 As long as these expectations are held, Halloween Horror Nights remains an enjoyable event. 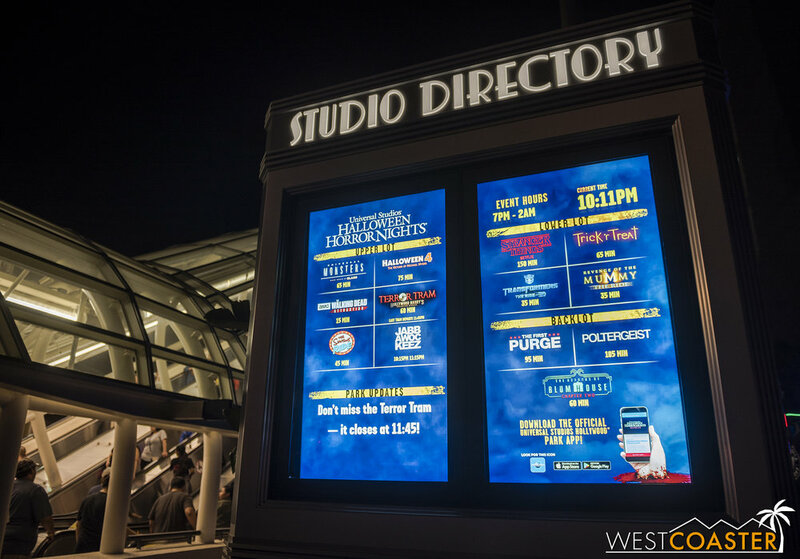 Fridays and Saturdays will remain very busy nights requiring early entry for any guest without Front of Line privileges who hopes to experience every attraction at least once. Strategy there will certainly be needed. But Universal Studios continues to deliver a top tier attraction to the eager Southern California Halloween enthusiast market. How it does that… well, it is what it is. 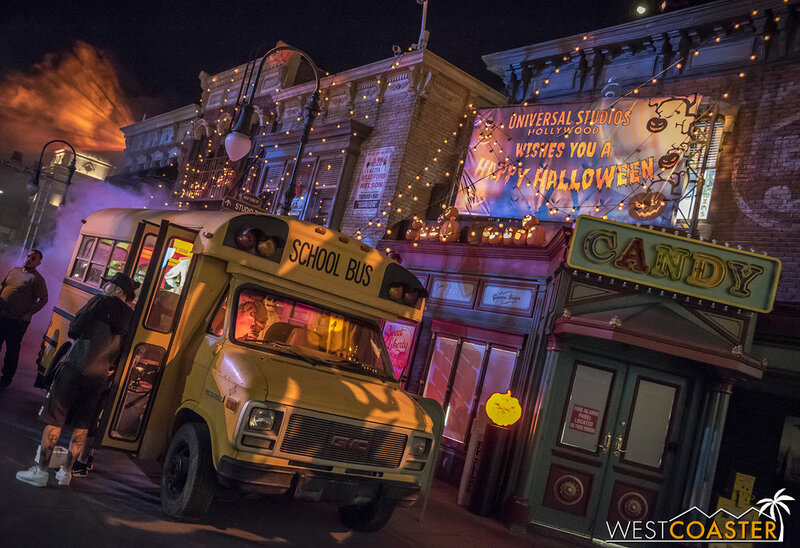 Bottom line: Horror Nights Hollywood is the place to see horror franchises brought to life with cinematic execution. Update, HalloweenAlbert Lam September 14, 2018 DisneylandDisneyland, Disneyland Resort, Halloween Time, Haunted Mansion Holiday, Frontierland, Tomorrowland, Space Mountain Ghost Galaxy, Main Street U.S.A.